Back in the mid-1970s, in Torquay, an England seaside town in the county of Devon, visitors to the area could stay overnight at a charming hotel known as Fawlty Towers. It was owned and operated by Basil Fawlty and his wife, Sybil. Any guest looking for a place to sleep would likely be content. But someone hoping for rest and relaxation might be bothered by the scornful Basil, whose thinly-veiled condescension was only slightly more conspicuous than his animosity for anyone who spoke or happened to be standing in the same room during one of his seemingly endless rants. 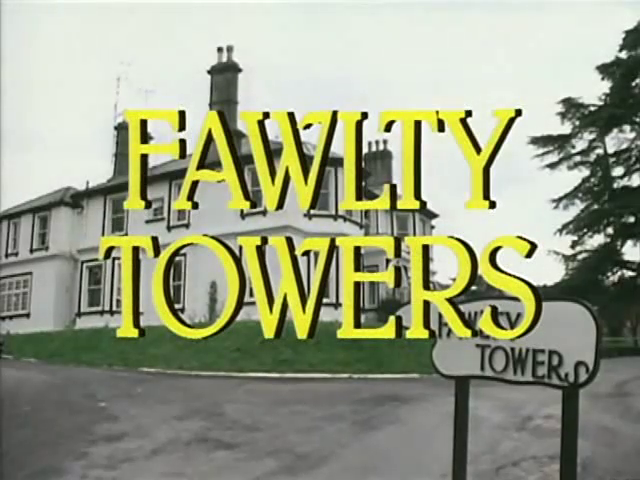 Fawlty Towers was a UK show that ran for two six-episode series, the first in 1975 and the second in 1979. 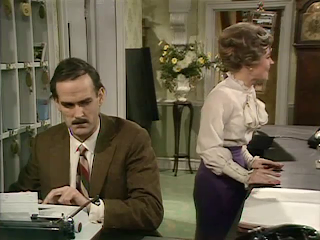 It was created by Monty Python alum John Cleese, who also starred as the neurotic hotel proprietor, and Cleese’s then-wife, Connie Booth, who appeared on the series as Polly, the hotel’s maid who handled multiple tasks (sometimes working behind the desk, in the restaurant as a waitress, etc.). Prunella Scales played Basil’s domineering spouse, Sybil, and Andrew Sachs portrayed Manuel, the porter and waiter from Barcelona whose English was significantly limited. 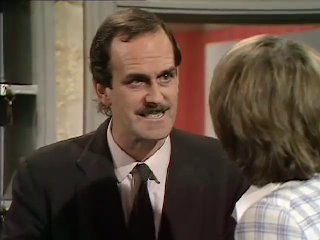 The comedy in Fawlty Towers comes from all sides: the husband/wife bickering, Polly helping Basil hide something from Sybil, Basil’s frequent misinterpretations of guests’ intentions or identities. But the highlight in a ceaselessly entertaining show is the interactions between Basil and Manuel. Evidently, Basil, when hiring Manuel, informed Sybil that he understood Spanish. This was clearly a fabrication, as he knows only a few words, and the simplest command for Manuel results in the two men futilely speaking back and forth. One of the best scenes, from the premiere episode, involves Basil asking Manuel for the wine list. Eventually, Basil resorts to pointing to the desired item on a table behind Manuel and – when the Barcelonan still doesn’t comprehend – picking up the wine list and handing it to Manuel so that he can give it back. The show likewise does a marvelous job of relating all the comedy to the hotel itself. Basil deals with builders working on the hotel, gets word of a surprise visit from hotel inspectors, and is constantly troubled with orders in the restaurant and the bar. The guests, too, provide much humor. 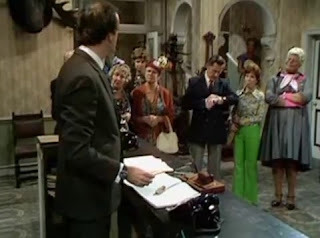 Another amusing sequence, also from the first episode, is a guest signing in and asking for a single room, before quickly changing it to a double because he’s “feeling lucky.” Basil, for his part, is conservative, going out of his way to please a visiting lord and refusing to allow a non-married couple to rent a double room – not even offering two adjacent singles. One of the show’s best episodes is “The Germans”, the fifth episode of Series 1. It’s noteworthy in many ways, one being that it’s the only episode that doesn’t open with an exterior of the hotel (and its sign altered in some fashion). It begins at a hospital, where Basil is visiting Sybil, who will be undergoing surgery for an ingrown toenail. Basil heads back to Fawlty Towers, where he is anticipating the arrival of German guests. Though he boasts of being able to finally run the hotel properly (sans his unruly wife is the insinuation), he cannot even handle a fire drill. After reminding as many people as he’s able of the impending fire drill, Basil inadvertently triggers the burglar alarm, causing guests to head for the door. He stops them and insists that the burglar alarm sounds distinctly different from the fire bell, which is “a semitone higher.” Then he hits the fire bell but won’t let anyone leave, as he’s merely demonstrating the difference between the sounds. Once that’s settled, he announces that the fire drill will commence in 30 seconds and is visibly annoyed when everyone stands in the lobby and waits (“I don’t know why we bother; we should let you all burn!”). Not surprisingly, when an actual fire starts in the kitchen, Basil believes that an agitated Manuel is overreacting. 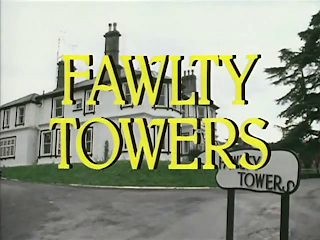 Though Fawlty Towers only ran for two series, it’s become common for British TV shows to only run for two or three series, regardless of popularity. Both The Office and Extras, created by Rick Gervais and Stephen Merchant, ran for two six-episode series, Christmas specials aside. The same is true for The Young Ones from the early 80s. There were only two series for the successful shows, Spaced, 15 Storeys High, and Green Wing, and Black Books and The League of Gentlemen never made it past a third series. The sketch comedy show, Little Britain, really only had three series, as Little Britain USA is generally regarded as a spin-off. The creators of these shows often resist pressure to continue their shows, typically to deter waning quality with additional episodes. Advocates of humor in British shows sometimes deem it more sophisticated than the U.S. equivalency, while adversaries may find it excessively pompous or stuffy. I disagree on both counts. Fawlty Towers is funny on a global scale. There’s wordplay, physical comedy, a barrage of insults, and quirky characters. It’s a celebration and adoration of the many faults of Basil and his hotel. And the appreciation of its humor is not dependent upon your nationality or locale. It’s funny just because it is. I'm a huge fan of Monty Python, and once my brother and I had exhausted the library's collection of Python DVDs, we moved on to other shows created by/starring the Pythons. That's how we found Fawlty Towers. (Oh, and personally, my favorite Basil/Manuel moment had to be when Basil asks him to wash the windows, then forcibly picks him up and carreis him to the window to teach him what that meant). "Fawlty Towers" never, ever gets old. The laughs are as hearty now as they were back in the 70s. Sometimes, out of nowhere, my husband will turn to me and say "Vermin, Fawlty" and we're giggling for the next hour! John Cleese is funny in just about everything, so I'm sure Fawlty Towers is a hoot. I think I've caught a couple of episodes on PBS, but really don't remember much. As for British humor, it is usually dry and a tad high-brow--to some Americans that means stuffy. Of course, then there was Benny Hill, which definitely wasn't high-brow or dry! I saw an interview with John Cleese once who related how when the BBC offered him the chance to do a series, he and Connie Booth immediately thought of a show based on a real hotel and real Basil Fawlty-like hotelier they had encountered in Torquay while there filming an episode of "Monty Python." By the way, I believe I did see a third series of "The League of Gentlemen" (another of my favorites--one of the funniest and weirdest comedies, even for the Brits). It was shown only once on BBC America and was somewhat different from the first two series. This is the series that made John Cleese my favorite comedian. I don't think anyone has expressed frustration and hysteria more hilariously. Terrific post on a delightful series, Sark! A truly perfect picki for this month. "The Germans" episode you highlighted is imminently quotable. One of my favorites exchanges is when Basil tells a nurse" "My God, you're ugly, aren't you?" She replies: "I'll... I'll get the doctor." Then, he quips: "It's a plastic surgeon you need, dear, not a doctor." Have you ever seen John Cleese's training videos for businesses? They remind me somewhat of his FAWLTY TOWERS humor. Sark, my best Fawlty Towers moment has to be in 1988 sitting in a room at the Intercontenninal Hotel in Israel watching a episode I had never seen on PBS in the states , coming from Jordan's state run TV in english. My favorite episode is the dead body one. I laughed until I cried. Literally. 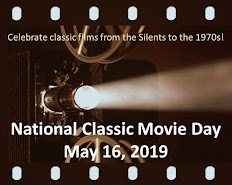 Thanks for a terrific post about this classic comedy series. Gosh, Basil Fawlty was an idiot. Doctor Who: Just the Doctor, I Presume?